Liz Earle MBE has been a respected and award-winning authority in the world of beauty, natural nutrition and wellbeing for almost thirty years. Sharing her knowledge as a researcher, writer and television broadcaster, Liz is also a bestselling author with more than 30 books on looking good and feeling great. Liz Earle Wellbeing, founded in 2013, draws on this respected research and trusted expertise to provide balanced advice and ideas on living well. From delicious, nutritious recipes to the best beauty advice, wellness updates, seasonal health specials, sustainability and environmental concerns, you’ll find a whole world of wellbeing here from Liz and her team. 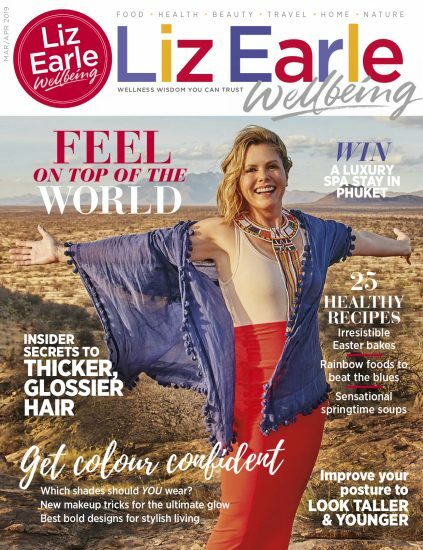 This website is a valuable online resource and is linked to Liz Earle Wellbeing magazine, available digitally and in print. Do bookmark us, sign up to receive our regular newsletters packed with free resources – and we hope you’ll come back and visit us often. Liz is known for her passion for beauty, natural health and wellbeing, as well as her charity and campaign work. She is a best-selling author, TV presenter, entrepreneur, and organic and pasture-fed farmer. Having started her TV career on ITV’s This Morning in 1989, she is currently back on screen as a regular contributor to ITV’s flagship daytime show, sharing her trusted advice on health and beauty matters in her Inside-Out Beauty series. Since the start of her career, Liz Earle has been passionate about food, farming and the environment. She is an ambassador for The Sustainable Food Trust, an advocate for The Soil Association and co-founder of the original food labelling pressure group FLAG. Several years ago, Liz returned to her roots as a long-term supporter of organic food, converting a derelict farm in England’s West Country to a thriving organic, pasture-fed farm where she lives with her husband and five children. Most recently, she has been appointed an ambassador for Love British Food. Her work with The Prince’s Trust, ACE Africa, the National Osteoporosis Society, CURE and other charitable organisations led to the launch in 2010 of her own UK registered charity, LiveTwice, providing opportunities for the disadvantaged in the UK and developing countries, notably East Africa. Showing entrepreneurial spirit from an early age, Liz has put her name to several successful brands. Her latest business ventures include Liz Earle Wellbeing and Liz Earle Fair and Fine, an award-winning range of ethically sourced, Fairtrade gold botanical jewellery, which won Emerging Designer and Ethical Jewellery awards in Professional Jeweller‘s Collections of the Year 2015 and Best Jewellery Collection 2016 at CMJ’s trade show. The collection is available to purchase from Cred Jewellery. In 1995, Liz co-founded the Liz Earle Beauty Co, now owned by Walgreen Boots Alliance. In 2007, Liz Earle was awarded an MBE for her services to business and she has also received an Honorary Doctorate of Laws from both Portsmouth University and Staffordshire University. Her recent bestselling books include Juice: The Ultimate Guide to Juicing for Health, Beauty and Wellbeing (Kyle Books, 2015) and SKIN: Delicious Recipes and the Ultimate Wellbeing Plan for Radiant Skin in 6 Weeks (Orion Spring, 2016), which shot to No. 1 on the Amazon Beauty and Fashion bestseller charts for four consecutive weeks on publication. This was followed by The Good Gut Guide, published in May 2017 (Orion Spring, 2017) also a No.1 Amazon bestseller. Her most recent book is The Good Menopause Guide, published in March 2018 (Orion Spring, 2018) which went to No.1 on Amazon on publication day – and remains a popular bestseller.